didn't Shelby have a race tire business ? That's what kept him alive. All his other businesses had ups downs and went bust on many occasions. The tire biz was steady and kept food on the table. When CS got the Goodyear franchise he was renting space at Dean Moons. Moon was the Firestone dealer. Firestone & Goodyear didn't like that arrangement and made CS move out. Update: Saturday we were on our way to NorCal and passed a truck, van and trailer. They were the support vehicles for Goodyear Airship Operations. The Goodyear blimp is based by CS's warehouse on land he is said to own with Goodyear making lease payments to him. Heard it in the 80s while at CS's. Anybody know if it's true? I'd suspect the opposite that CS was leasing the warehouse from Goodyear. Previous owner 6S843 - GT350H & 68 GT500 Convert #135. 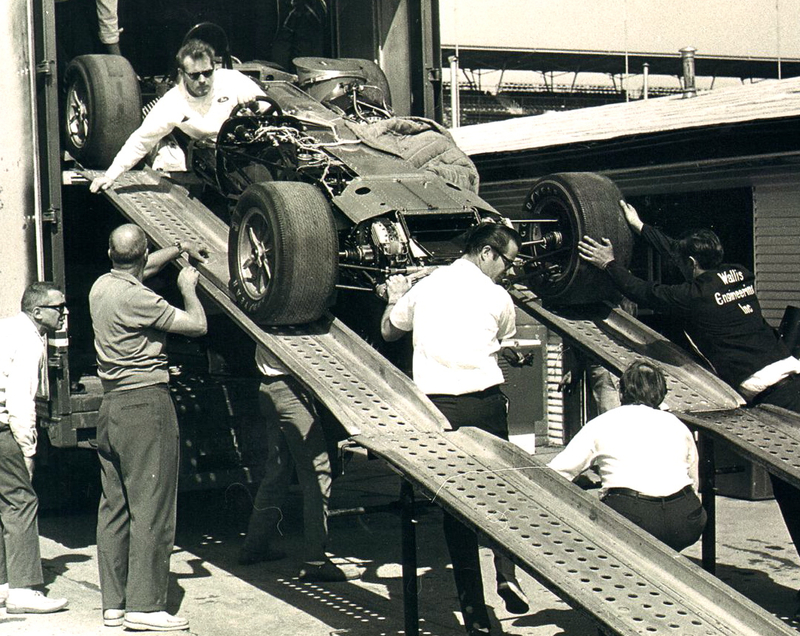 Rich, here's a shot of the Shelby/Wallis turbine unloading at Indy '68. you can see some of the transporter here. Nice find Mike...we can see the three side stripes on the box trailer. 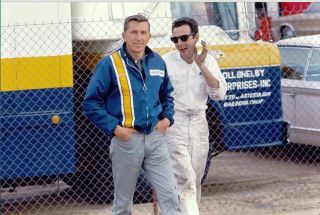 Rich, here's another one, this is at Laguna Seca for the Can-Am race in '68. I'm not sure if Shelby had a entry in this race ? or if this a support truck, didn't Shelby have a race tire business ? Another interesting later photo Honker. What the address on the cab door? (If you add " =width 999" after the text "image " in the BB code, it should allow the photo to fill the screen without the annoying scrolling bar. 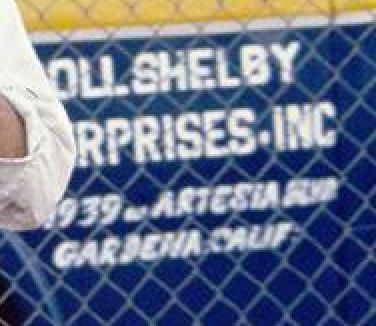 Rich, here's a tighter image of the address on the truck. Still a cool photo...larger version on page 12. I don't know if anyone ever figured out what the silver car's CSX number was. Were there any 64 or 65 Falcon Sedan Delivery Shelby support vehicles? I know there was a 63. I have a 65 and I was thinking of doing it up like that 63. White with the blue stripes. 68 1/2 CJ Mustang GT FB auto 3.91s, 68 1/2 CJ Torino GT FB 3.91s, 2 57 T Birds. 58 T Bird, 61 T Bird, 64 Falcon Sprint conv. 4Spd, 65 Falcon Sedan Delivery, 67 Fairlane 500 SW 428 4Spd, 68 Torino 4dr, 95 T bird SC. I guess I'm a Ford guy? Only the '63 Falcon sedan delivery was used that I'm aware of. The school switched to the Econoline van shortly afterwards. 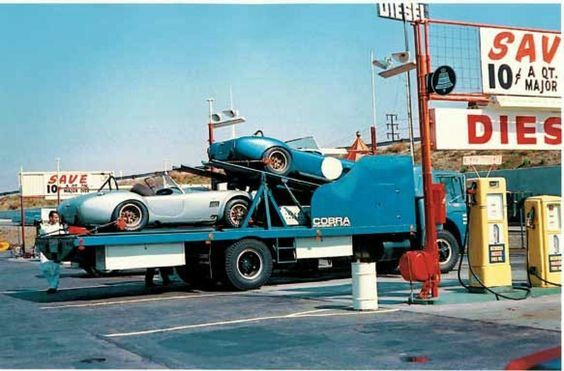 Quiet here for a while, here's a pic of one of the Shelby Toyota 2000GTs, you can see the hauler in the background. My files say this is Mid-Ohio 1968. Rich hope this isn't out of sequence, you had some order to your posts. (date corrected to '68 thanks Rich ! Nice find Mike, definitely the Shelby trailer with those stripes. I might have to look up the Mid-Ohio '67 events to see what other Shelby Team cars were there. The photo of the Shelby Toyota in race trim was most likely taken in 1968 (not 1967). Toyota only raced the team cars in 1968 in the US. The Mid-Ohio SCCA event was September 7th-8th 1968. I did not find any race results for any of the weekend races in any class. Rich, thanks again for correcting me on the date for the 2000 GT at Mid-Ohio, her's another pic I have, only shows the ramps from the transporter, but what is that red car lurking in the far left of the photo ? could it be a Cobra ? Nice!! a second photo from the opposite side too! Yes, it sure looks like a red Cobra. Kranky's race results show csx3028 with Jack Hurt was there. I don't know if was painted red by 9/68. I have photos of it in white 11/66.